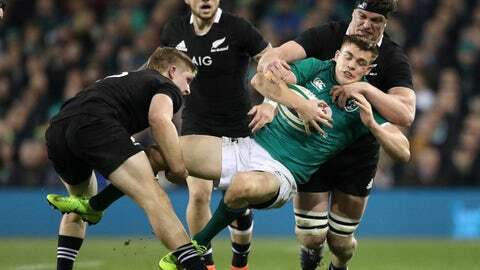 DUBLIN (AP) — Only center Garry Ringrose has kept his run-on jersey in the Ireland side meeting the United States in a rugby international on Saturday at Lansdowne Road. Ringrose was the only repeat starter from the 16-9 win over New Zealand last weekend, while prop Cian Healy and flanker Josh van Der Flier were in the reserves. Lock Iain Henderson, flanker Jordi Murphy, and flyhalf Joey Carbery were replacements against the All Blacks and promoted to starters on Thursday, while reserve scrumhalf Luke McGrath was retained. Flanker Rhys Ruddock captains the second-string side which more closely resembles the one which thrashed Italy’s backup players 54-7 in Chicago at the start of the month. Stuart McCloskey teams with Ringrose in midfield for his first test in a year, and uncapped Munster center Sam Arnold was in the reserves. “I wanted Stu to get in between a couple of ballplayers, but challenge him to be a ballplayer as well,’ coach Joe Schmidt said. “We know he’s a ball-carrier, we know how strong he is. (U.S. opposite) Paul Lasike is one of the few men in world rugby who is actually bigger than him in his face-to-face positional challenge. The U.S. comes to Ireland unbeaten this year, on a nine-test winning run, including one over Scotland. It started this month with a non-cap loss to New Zealand Maori, beat Samoa for the first time, and handled a depleted Romania 31-5 in Bucharest last weekend. The Eagles have improved to a rankings-best 13th, above Italy for the first time. “If you’re not absolutely on the money then there’s a big risk for us,” Schmidt said. Regular scrumhalf Shaun Davies has completed concussion protocols to start, and Will Hooley was at fullback after a late injury withdrawal last weekend.